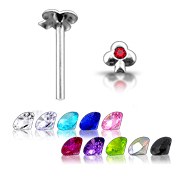 925 Grade Sterling Silver nose stud with a 3.6mm Clover design. The Clover has a Top Quality 1.5mm Swarovski gemstone in the center. Choose the color that suits you best! Gemstone or Design Size 3.6mm Clover with 1.5mm Swarovski Gem.